Rockman Corner: Your Jacket, Megafied! 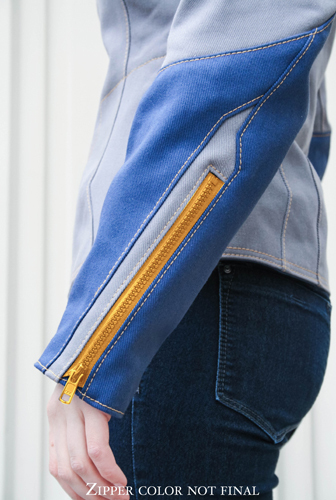 "Inspired by classic Mega Man, Capcom and Volante Design team up to bring you The MegaJacket. The latest in our line of Capcom Store exclusives, the MegaJacket sports accents that evoke classic Mega Man while maintaining a stylish silhouette perfect for everyday wear. Sturdy, comfortable and commanding, the MegaJacket is sure to become a favorite. This is a limited release and will be produced based on pre-orders. The men's cut pre-order minimum is 200 units. If we don't reach the minimum the project and all pending orders will be canceled. So, tell all your friends and be sure to reserve your MegaJacket by March 31st." How much are they asking for? How's $200 sound? If you've got the dough to spare, hit up the Capcom Store. Enter the code MEGA10 for $10 off! Gah. For $200 I'll make my own and pay my rent for a month.. kthnx. I'm sorry, what? No. I'm not paying $200.00 for something my friend could whip up in two days for a fraction of that. It's probably nowhere near as warm as my Adidas coat or even my hoodies, either. I'll admit it looks kind of cute and all, but that price tag just says "sucker" to me. I want it, but $200?! Jesus Christ. If it weren't so expensive, I'd hecka buy one. They would make a lot of money off this if they released more for cheaper. I hate to be "that guy", but it seems like they are making it impossible for us to continue to support Megaman so that they can later say "the fans just aren't buying Megaman anymore." you're not "that guy". "that guy" would say 'if you don't buy it, then you're not a mega man fan'. I hope I don't come across as a ungrateful fan. I would like to have a minimalist style mega man jacket. Something that looked good as a casual and fan jacket. But this design doesn't look appealing, its way overpriced, and its won't last long. Good job trying. As much as I try to not post anything when the negativity starts creeping in, I'd actually much rather have the Punk Drunker hoodie than this, and I couldn't stand those P-Tank pockets and logo on the front. That seemed more stylishly fun, with a more fitting design and color scheme, and it was cheaper on top of it. This only looks fashionable if you leave off the hood and eliminate the two-tone sleeves all together...but then it's not really a Megaman jacket, is it? More power to the designer for coming up with it and getting partnership with Unity for it. The sketches on their blog showed promise, even with an different initial design, and I kinda liked the sleeves better in that concept. But as an overall item, I wouldn't be sold on paying $100 for it. Sad to say, but I'd be fine seeing this miss hitting 200 preorders. Alright, so they're doing this with the company Volante Design, which has also done some wicked Assassin's Creed jackets. Usually their stuff goes for around $300. The cheapest jacket on their site is $150. I also looked at some reviews for their other products; while most of them say that it's amazing looking and how they and/or their friend/family love it, there are some that praise it's fit, durability, and say it's well worth the money. My question is, if I pre-order and there's not enough pre-orders to meet demand, am I charged at all? If I'm charged at checkout, do I get my money back? Now that you mention it, if you rip the colors and the megaman-esque "design", paint white...you got an assasins creed jacket, man even the hoodie has this "V" design on front. Sorry but no. I love Megaman, but no this overpriced jacket. people on etsy make custom hoodies for half, or even less than half this price. Sure, it;s not official by Capcom, but they're just in it for the money! I prefer to get someone to make it for me who really cares about the franchise, like I do! They need to put the crack pipe down. $200?! What is that jacket made out of?! $200? I can buy Iron Man, Captain America, Batman and Punisher hoodies with just as much, if not more, custom material than this sweater for just over a quarter of the price. 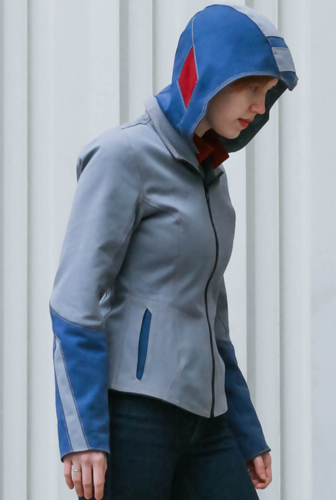 And as some are mentioning it looks like an Assassins Creed hoodie with how the hood part is. And in fact, it may be. Those designs at the end are identical, and look like the size of Ezio's hidden blades. This screams shady and lazy. Definitely Assassin's Creed inspired. One of the first things I thought of when I saw it. It's kinda cool, but not worth $200. It's as simple as that. This Hoodie is a piece of junk. Capcom, you can go away and get your 1 cent with you. No money for you. Go away, Capcom! I am sick and tired of Capcom sniff our money for their wealthy!!!!!!!!!!!!!! Make Megaman games or forget it! But CAPCOM aren't making this hoodie.